is Nationally and Internationally Known! 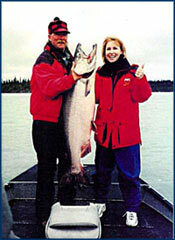 For over thirty years, clients from all over the world have fished with the Harry Gaines Team on the Kenai River! This prestigious camp has been featured in some of America's most popular outdoor magazines and on nationally syndicated television. Accounts of our fishing experiences have been published in many of the nation's leading daily newspapers. Harry Gaines Kenai River Fishing is located near Kenai, Alaska, on the beautiful Kenai Peninsula; a scenic drive from Anchorage or a 30 minute flight by air. You can take a beautiful scenic drive from Anchorage, plan on a good 4 hours so you can stop at some of the sights on the way down. Or you can catch a commuter airline to Kenai daily; it's a short 35-minute flight. Car rental agencies are available right at the Kenai Airport. 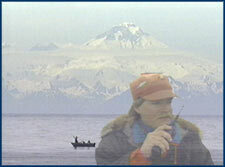 Contact Harry Gaines Kenai River Fishing for complete information regarding your plans to come to the Kenai Peninsula. Anchorage to Soldotna - you will pass by Girdwood, Portage Glacier, Hope turn off, Moose Pass & Seward exit, Cooper Landing and Sterling. Take the Seward Highway out of Anchorage until you reach the Sterling Highway exit. Take the Sterling Highway all the way to Soldotna. At the second stop light in Soldotna, take a RIGHT turn onto the Kenai Spur Highway. About 1 mile from the stop light you will see a BLUE & WHITE sign on the right that reads "Harry Gaines Fishing/Lodging". It has an arrow on it pointing to the road on the LEFT. This is BIG EDDY ROAD. Turn onto Big Eddy Road, follow it for almost two miles. When you are almost to the end of the two miles the pavement ends and then there will be a yellow gate on the side of the road that says "Private Drive." Go through the gate, we are about a block and a half down, on the left. SEE YOU HERE! !